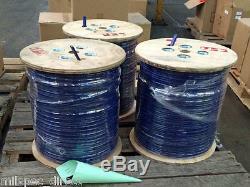 250Ft 12-Gauge 3-Wire + Ground Submersible Pump Water Well Cable. Milspec flat double insulated submersible pump cables are designed for maximum performance and safety. 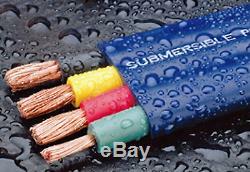 We use only soft-drawn, bunch-stranded 100% copper for maximum flexibility and amperage transmission. Each conductor is jacketed with water resistant 600V PVC insulation, which is drawn tightly into the conductor interstices to prevent moisture seepage between the insulation and the conductor. The conductors are then laid side-by-side and a 600V PVC jacket is pressure extruded to form the flat parallel cable construction. As a result, these cables are extremely flexible, easy to install and stand up under hard service use down the well where it counts. Copper Construction: 65 x 30. 0.242 x 0.848. Sequential footage markings printed on the outer jacket mean you never run short on a drop and make inventory control a snap. While we make every effort to insure that stock is available when you place your order, all products are subject to prior sale through this and other venues. If we don't have the item you ordered in stock, we will make every effort to substitute a similar product of equal or greater value. In either case we will contact you and advise you of the situation. Thank you, and welcome to Milspec Direct! The item "250Ft 12-Gauge 3-Wire + Ground Submersible Pump Water Well Cable Double Jacketed" is in sale since Friday, April 6, 2018. This item is in the category "Business & Industrial\Hydraulics, Pneumatics & Pumps\Pumps & Pump Accessories\Pump Parts & Accessories\Other Pump Parts & Accessories". 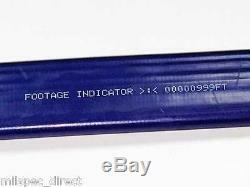 The seller is "milspec_direct" and is located in Los Angeles, California. This item can be shipped to United States.